The Luxury Support Brand by InnoMax is one of its two brands with the Convert-A-Bed (CAB) construction. The other brand is Comfort Craft. Luxury Support has five CAB models: Medallion, Cashmere, Mystique, Harmony and Evolutions. The Luxury Support Brand also includes six hardside waterbed models: LS-8300, LS-7300, LS-6300, LS-5300, LS-3300, and LS-2300. Also under this brand is a 2.5" two-sided reversible topper. Convert-A-Bed is a system of mattresses with a choice of the type of support. The support core of a CAB mattress is a self-contained module. The type of support can be air, fluid (water), latex, Memory-Cell (like memory foam), or InnoCoils (pocket coils). The last three kinds of support modules are plush on one side, firm on the other. Turning the module over chooses the comfort level. 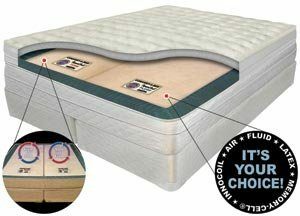 In a Queen or King size, there are two modules, so one sleeper can have firm and the other one plush. The comfort level of air is controlled by adjusting the pressure. In a Queen size or King size bed, there are two controls, one for each side, as in Sleep Number, ComfortAire and other two-person airbeds, meaning individual comfort. Two advantages over the flippable modules are (1) you do not have to open the mattress and turn the module over, and (2) there are more than two comfort settings. Fluid support is even more different. The firmness of a support module is basically set. Adjusting the amount of water in a water chamber is not as simple as turning a dial or pressing a button. Layers of fiber in the water chamber determine the flow of fluid in the chamber. Options for fluid support modules range from free flow to super waveless. Free flow is referred to as "weightless" support, and super waveless is the firmest. The variable in fluid support is the temperature. The water in a fluid support module is heated, and the user can control the temperature. In King and Queen sizes, each side is controlled separately, which is ideal if one sleeper likes it warmer or cooler than the other. 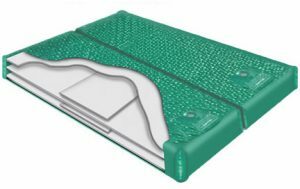 The InnoMax Luxury Support Brand also has hardside waterbeds. These range from free flow to ultra waveless/ultra firm. Models listed above do not include the waveless design, so ask about it if that's what you want. For those who want more cushioning on top of the bed, InnoMax has the Luxury Support 2.5" Memory-Cell/Latex Topper. InnoMax does not sells their products, including Luxury Support, directly; they only sell through retailers. Warranties on Luxury Support mattressses are for 20 years, except for Evolutions and Harmony models, which are for 10 years.